A welder was yesterday fined $25,000 after admitting to kicking his girlfriend during a heated argument. Sheik Hassan of Lot 24 Mon Repos, East Coast Demerara, pleaded guilty to assaulting his girlfriend. Sheik Hassan, 24, appeared before City Magistrate Fabayo Azore in the Georgetown Magistrates’ Courts and pleaded guilty to the charge which alleged that on June 6, last, at Hadfield Street, Georgetown, he unlawfully and maliciously assaulted Dolly Arjune. Police Prosecutor Simone Payne told the court that on the day in question the defendant went to Arjune’s workplace at Silvies General Store and dealt her a kick to her left foot as a result of an argument they had. When the magistrate give Hassan a chance to address the court he stated that on the day in question he went to his girlfriend’s workplace and she embarrassed him in front of her friends. 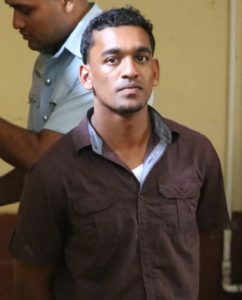 “Is three months now me ain’t get to see her and when I do show up at her work place she been stand up with another man and her friends so I raise my foot and give her a li’l kick and her friends were laughing at me.” Hassan further told the court that the woman’s friends assaulted him. When the magistrate asked Arjune if she want to be in a relationship with Hasssan, Arjune disclosed that she no longer wanted to be in a relationship with the man. Failure to pay the fine of $25,000 will see him spending seven days in jail.